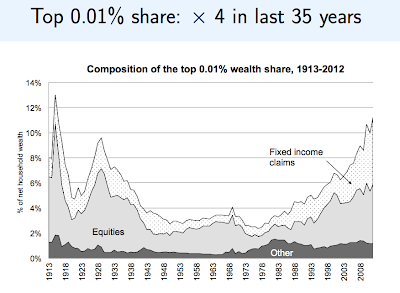 Recent increases in wealth inequality mainly due to top 0.01%, not top 1%? See this article (The Atlantic) and also here. Net worth distribution within the population of top wealth holders (assets > $2M; about top 1% of adult population): having $10M puts you in the 90th percentile (so, top 0.1% of total population) and $50M puts you in the 99th percentile (top 0.01% of total population). Why did you waste your time on this. Is being a Dean a sinecure? Inequality is built in to humans as it is in all organisms. The equality fetish leads inexorably to some sort of totalitarian dictatorship. By the way, you're a Dean not a faculty member. Wear a suit. Aren't you interested in secular changes in these quantities? Sorry for the unintentional demotion. The monkey and rat brains were drinking coffee, and communications defaulted to the snake brain, who is subject to hissy fits. Sorry for his nastiness. The whole bit about income inequality is really a device used by left-wing extremists like Obama to push for a totalitarian socialist state. "BTW, I'm not a dean, I'm a VP"
A distinction without a difference and an annoying import from corporate America. Why did you waste your time on this. Is being a Dean a sinecure? fetish leads inexorably to some sort of totalitarian dictatorship.FALSE. By the way, you're a Dean not a faculty member. Wear a suit.Suits are for people who do nothing but take credit for other people's work. But can an increase only in the .1% produce the increase in the GINI? Yeah. Who would wanna live in Norway? The germanic language speaking states of Europe, excluding the British Isles, have higher living standards than the US and it's people have no desire at all to move to America. There are some, very few, who pay 50% a year in the US, but in general taxes are already flat. A member of Prometheus concluded that because the human mind operates in parallel, problem solving speed doubles every 5 IQ points, so let's assume it's true that Bill Gates has a 170 IQ (probably not true). That would make him potentially 16,000 times more productive than the average American. If you multiply that by his considerable drive, it's not hard to see why the wealth distribution is skewed. As for wealth being less correlated with IQ than income, that's probably because the wealth distribution is so skewed and because wealth is much harder to quantify than income and because a lot of wealth is inherited, while income is much more self-made. Also wealth is sometimes a poor measure of economic success. For example you can be living in a $100 million house, but because you're $200 million in debt, you have a lower net worth than a homeless person. Such anomalies would limit the correlation between IQ and wealth. Are these individual net worths or household networths? My calculations show it's for every 5.397 points. Is the Prometheus Society's test published by Kellogg's, General Mills, or Post? Was he a neurologist? As someone with ample IQ points and former Mensan, very apparent to me that there often isn't a huge difference between normal, and high IQ, and where there is it often isn't pretty (one of my fellow maths students was clearly both exceptionally brilliant, even amongst mathematicians, and also some sort of sociopath). Locally Mensa was full of people with some pretty wacky ideas, so I fear that the observation that IQ and critical thinking may be, if not orthogonal, then only weakly correlated seems to match my experience. Once you have sufficient IQ points to achieve your goals, what matters is other skills and abilities. Kasparov's IQ is not that impressive (although it has been falsely put at 190 it isn't any where near that according to more reliable sources, Steve previous mentioned Die Spiegel testing it to 135), but Gary can remember nearly every chess game of consequence he has ever seen. Think about that for a bit, someone who has read every major chess book, watched and analyzed every major chess tournament, studied the games of all the top players he might face in becoming world champion, and given a (unique) position from any of them he can generally name both players, and the next move (and yes he has been publicly tested on this claim). So yes some people are exceptionally better at some things than others, although IQ tests are probably too broad for this to be true of IQ. But productivity is bounded by other things, like the need to sleep. Productivity does vary hugely in many ways, but it isn't simply productivity (or IQ) that distinguishes my very limit wealth from Bill Gates, although he is both more productive and smarter than me. In America Mensa et al is generally considered...er...for people who think they're a lot smarter than they are. are homogeneous at genetic level compared to chimps and other apes. Someone smarter than me appears to me as a better version of myself and someone dumber...I think, "there but for the grace of God..."
prejudice that the genetic basis of intelligence is mostly illusion. But there are many people like Kasparov who can do things I can't imagine ever being able to do. Here you can see as clearly as you like that IQ and income are poorly correlated and that for those with at least a bachelor's degree there is no correlation at all in the US. Here the variable "wordsum" = IQ. The full range isn't covered. If the population is representative then income and IQ are cut off at the top 2-3%. Is the full range conditional expectation non-linear? Kinda looks like the top two brackets haven't really accumulated any wealth, but that as the same bonds and stocks have been marked up in price they are reported as richer. This would make sense given the author's methodology. If in 1980 I report $10 of dividends on my 1040, you can infer that I own $100 of stock since dividends were 10 percent. Today if I report the same amount of dividends, you can infer that I own $500 of stocks since dividend yields are only 2 percent. This increases measured "wealth inequality" without the rich actually becoming richer. When my condo goes up in price from $500k to $10mm, I am no richer if I am still living in it. aren't you ignoring that almost everyone has financial assets? perhaps the very rich have more balanced protfolios? and what happened to the 1-.1%? 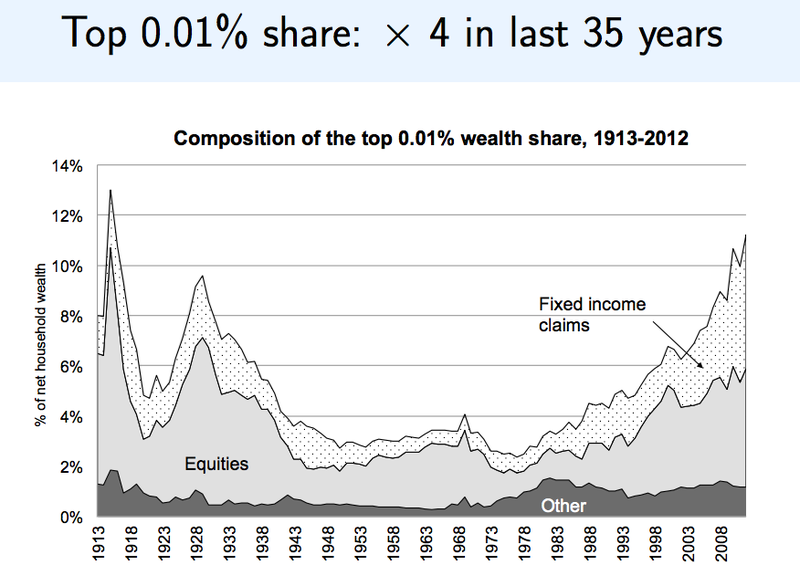 I am kinda assuming that the top 0.1% start with large disproportionate ownership of financial assets in 1980. And I suggest that a significant part of their wealth expansion relative to others is from those assets going up in market value. For this to make sense, as you say, the 1 - 0.1 group must be much less concentrated in financial assets. And that may be true. Is there any sophistry too petty for you? maybe. this paper is consistent with steve's earlier post that once a few zip codes are removed inequality hasn't increased. but this can't explain the gross increase in the gini coefficient. but it is good that inequality is discussed, is an issue. it's ly's wont to dismiss his inferiors as stupid and/or lazy, but he hasn't thought it through to the end yet. look, if you tell me that my "inferiors" are so poor that they don't have any bread to eat, why don't they just eat cake? "look", he said diffidently, "my pedigree begins with me." Very good question. People with house poor should not be count as wealthy. Most 0.1% riches own finacial security more than stocks. A very judgmental comment. Yes, I am judging you. Also analysis of wealthy is really helpful for personal development. Poor people are not very interesting. Dont you want learn something from wealthy? Thanks for the data. Intriguing as always. So: The 1% 135-140 IQ's (professional/business people, MBA's) tend to have $2M is assets, 1 in a 1000 145's IQ's + ( e.g. top MD's) 10MM, and 155's + IQ's ( e.g. inventors) often 50MM in assets. And the 1 in a million IQ smarter-than-Einsteins are billionaires who left college by actually giving a product away to consumers for free (Facebook). What a shock. We need communism immediately! And forget that if they decided to give us their wealth, it would come to maybe 10K per person after deducting for market values crash. Then what? I believe these studies also deliberately underestimate the wealth of the bottom 70%: They ignore home value, pensions, and the fact that their labor is not monetized on the market vs .the often illusory asset figures for stock ownership, people the IRS does not track, and other factors. The Libertarians lowered tax rates and many petty regulations on trade, what became the web and so on, and began a campaign to spread market democracy in the 80's. The Higher IQ were able to act as never before and is doing well and will continue to do so. ( http://www.libertarianinternational.org/apps/blog/entries/search?utf8=%E2%9C%93&query=income and check out the Friedman article). Meanwhile the average Chinese citizen today has ~10X wealth and income from back in the Communist days and has in those terms out-of-sight wealth thanks to chucking egalitarianism for baby-steps market democracy. It would be interesting to see a study tracking the wealth of consumers thanks to the Hi-IQ work. I'm a poor student who now enjoys a computer once worth billions. How do they track that?